LOS ANGELES - Qualifier Carsten Ball of Newport Beach will need his own army to conquer Sam Querrrey and his Samurais in the finals of the LA Tennis Open. Carsten Ball, ranked 205th on the ATP World Tour, defeated Argentine Leonardo Mayer 7-5, 7-6 to reach his first ATP Tour Final. Ball seemed to play with confidence. 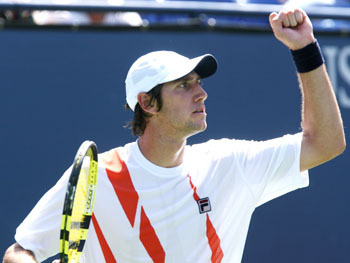 He kept the score close against 60th ranked Mayer and was able to take key points. Big serves and successful volleys gave Ball the edge he needed. In the last game, Ball threw in an ace for match point and was able to close for the win. He served at eighty four percent first serve points won and fired 10 aces. Ball is coached by his Australian father Syd Ball who had a successful doubles career on the ATP tour. Carsten Ball currently plays Davis Cup for Australia. 21-year-old Sam Querrey of Thousand Oaks, CA outlasted 31-year-old German Tommy Haas 6-3, 7-5. Querrey served seventy seven percent first serve points won and eight aces. With Querrey's quick court coverage and powerful forehand, Haas could not execute at important moments. Haas said, "he played some of the big points better." When asked about the US Open, Haas said, "I want to peak there, that's for sure." Over the past year, Querrey has improved his foot speed and movement on the court and the results are evident. He has reached his third final in his last three consecutive tournaments. He lost to Rajeev Ram in Rhode Island and Robbie Ginepri in Indianapolis last month. He holds one ATP title from Las Vegas in 2008. The two have not played each other since the 2005 ITF Junior Easter Bowl finals where Querrey took the championship 6-3, 6-3. A blog of that match can be found at Zootennis.com. The final will be the first all Southern California final since 1984 when Jimmy Conners defeated Eliot Teltscher. In his press conference Querrey seemed relaxed and full of confidence. After reaching his third final appearance in the past month he said, "I'm feeling better with every match." Querrey battles with a contigent of high school buddies in the crowd cheering and supporting his every shot. When asked about the loud-cheering, shirtless, painted, Samurai supporters, "you couldn't ask for a better group of friends," he said. "They help me get through tough points." The Bryan Twins of Camarillo will seek their fifth doubles title in Los Angeles. They were champions in 2001, 2004, 2006, and 2007.